A British man currently serving in the Army has travelled to the Middle East to join Kurdish troops fighting the Islamic State (IS, formerly ISIS/ISIL). The unnamed man is believed to be a 19-year-old serving with 2nd Battalion The Princess of Wales’s Royal Regiment. According to Sky News, the soldier, who is on annual leave, intends to spend a year with the Kurdish forces. If he doesn’t return to the Cypriot base when his leave ends, he will be officially reported AWOL (Absent Without Leave). Sources say the priority is to ensure he’s safe, rather than punish him. “I've gone to join the Kurds in Syria and Iraq,” he wrote to his family. “I'm with other British people and a Canadian at the moment. The solider joined the army at the age of 16, and is said to have been learning Arabic. Members of his battalion have been part of the UK’s operation against IS, helping to train Kurdish forces in infantry tactics, but it’s not known whether the soldier had taken part in training. The soldier is believed to be the first serving member of the British Army to join Kurdish forces, but former soldiers have reportedly joined the conflict. In December, it emerged that two ex-soldiers had traveled to Syria to fight the Islamic State after feeling “compelled” to join Kurdish forces following the murder of British aid worker Alan Henning. 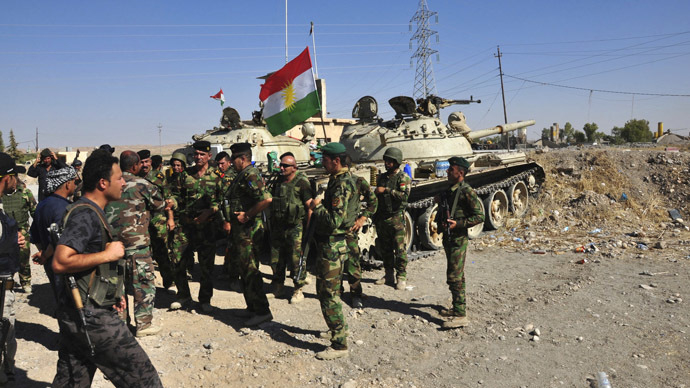 Jamie Read and James Hughes are believed to still be aiding the Peshmerga in Kobani, the scene of a months-long siege and the frontline of the battle against IS. Read and Hughes met online on an anti-IS Facebook group, and made the decision to travel there to aid Kurdish forces. They flew to Istanbul from Manchester, before crossing the border to Kobani. Speaking to the BBC from the recently liberated Syrian city, Read described seeing villages attacked and the persecution of local Kurds. “My family were nervous and obviously worried about my wellbeing – we have gone into an unknown world. “But I’m a firm believer that if you want to do something you have to do it, not talk about it,” he added. Eleven of the men’s fellow fighters in Syria have reportedly been killed in gun battles and IS suicide attacks.